This is another release from the vaults of Unitel, the Munich-based company that spent a small fortune making classical music films in the 1970s. 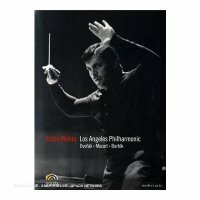 Karajan and Bernstein were featured in dozens of films but other conductors such as Böhm, Abbado and Solti also appeared. Most of these productions were initially released on VHS years ago but only recently have they made their way to DVD. Deutsche Grammophon has been issuing the bulk of the Unitel catalogue but other companies are issuing those passed on. The Mehta release documents an important stage in this conductor’s career. Mehta was twenty-six when he became conductor of the Los Angeles Philharmonic and he stayed for seventeen years, growing into a major conductor. These performances were recorded in 1977 in concert at the Dorothy Chandler Pavilion. Mehta left the following year to take over the New York Philharmonic. Kirk Browning of Live from Lincoln Center was the producer and RCA veteran Max Wilcox was the sound engineer and their work is first-rate. There are two major works: Bartók’s Concerto for Orchestra and Dvořák’s Symphony No. 8. The orchestra plays superbly and Mehta is at his charismatic best. He could pass for either a Hollywood or a Bollywood film star playing a great conductor. Fortunately, he was also a great musician. From these same concerts there are two shorter Dvořák pieces and Mozart’s Bassoon Concerto with the LAPO’s principal bassoonist as soloist. These were not from real public concerts. They were TV tapings, they started about 10am, and were open to the public for free. Each work was done 2-3 times straight through. I was a teenager and cut school to attend and saw the Bartok (3 times) and Dvorak works.